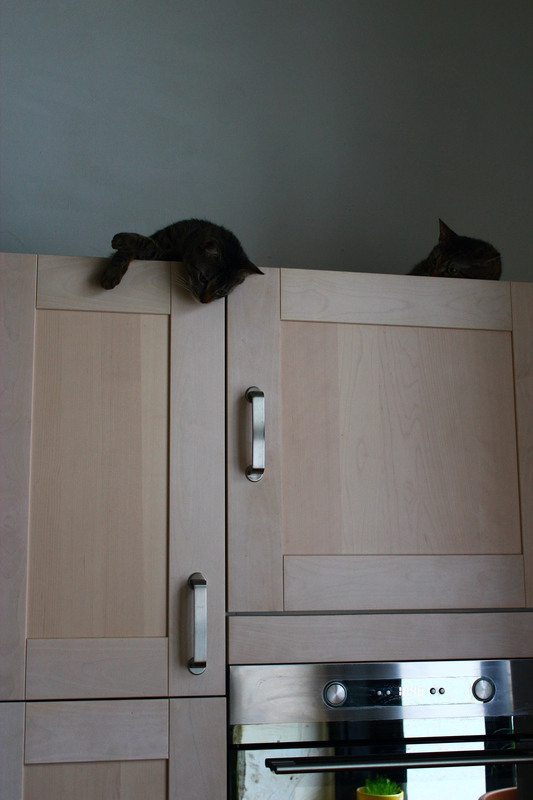 Today I decided to take you on a little behind the scenes tour through our kitchen. You’ll get to see the place and meet some “people”. We renovated our kitchen some years ago. We basically started from scratch, floor upwards. By now all the newspaper covers are gone and it became a comfy place where we can cook and bake. Maybe it has something to do with the work we put in the kitchen redecorating that I feel like cooking is something really precious that I like. Maybe that promoted the idea to start a blog on cooking and baking? I could make some dreams come true with the new kitchen. The oven has a grill now and a timer. But the best part is that it is chest high, so in perfect position to load the oven with cookies without bending down. We are actually not so fond of kitchen equipment or technical equipment in general. For instance we don’t have a freezer, nor a dish washer. There’s not even an electric kettle (Why would there be? This also works with the stove). But I do have a juicer, a coffee grinder and a toaster. And I have an apothecary cabinet. Basically everything fits in here and I can see it at first glance. Some old friends and customs moved in the new kitchen, for instance my espresso machine and gas for cooking. Because some things should not change. I have lots of tea, because tea always works! Same goes for herbs and spices. 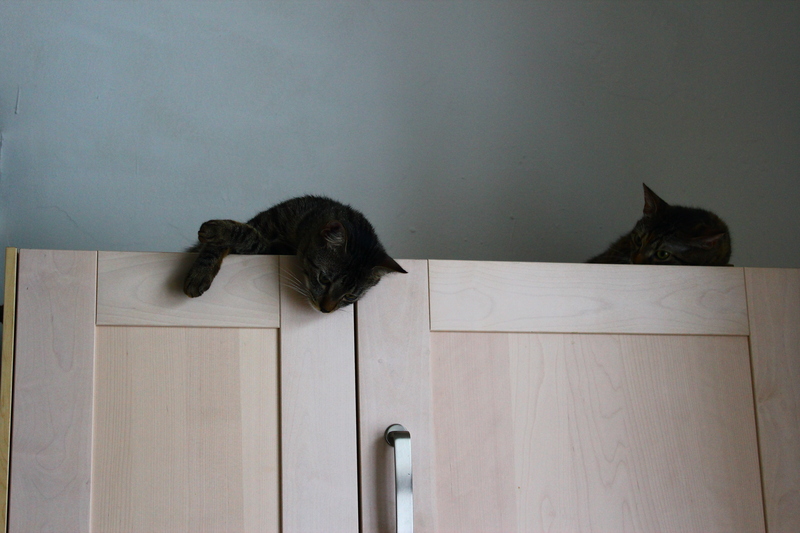 They also like to sit and lie on the kitchen cupboards and cabinets. Only Mrs. Shaolin does not jump sooo high anymore. But Luna, also known as Honnold Cat (like the climber), Climbing Cat, Killer, Crazy Cat or just Missy, makes up for it. She can walk up the kitchen window and she can carry ping pong balls like no other cat I know. And she is almost not afraid of water which is why in summer she likes to sit in the sink. By now she even taught Momo how to walk up the window. So they both sit in there sometimes, especially when it’s raining. Momo, also known as Messi (like the soccer player), Master, Chomsky (like the linguist) or Moppel, is a little more laid-back than the missy. Yet, whenever she can think of something stupid he will go for it, too. The kitchen table you’ve seen above actually is his, but unlike Luna he can share. And then there is Shaolin, also known as Mrs., Warrior or Chiller. As the oldest of the three, being about 10 years apart, Shaolin is even more laid-back than Momo, except for when we are making salmon. That she gets so excited about eating always makes us happy. When it comes to eating we have had our problems with our cancer patient. We took her into care about a year ago and of course she stays :). So, that is already it. I hope you enjoyed the tour.